My name is Taylor Niele Sellers. I am a small-town Georgia based bridal hair stylist, colorist, & educator! Most days you will find me with my amazing hubby & our rescue dog, Harra May. Although I am a homebody at heart, I get to travel all over teaching classes to other stylists & my bags are always packed for my next big adventure! I am obsessed with dogs, blondes, anything pink & WEDDINGS! As a second generation hair stylist, I have trained under the best of the best internationally & have worked my way to the top of a large salon cooperation through serving my clients well by meeting their hair needs while being their friend. My style is very whimsical, natural, "lived in" yet very classic. I love a good glass of Rose’, grey's anatomy, & hanging out at home. My mission is to provide the best service experience possible & gain a lifelong friendship after. I am extremely friendly, personable and professional. Years from now, I want you to look back on your photographs & smile because all of your “Pinterest hair dreams” came true! 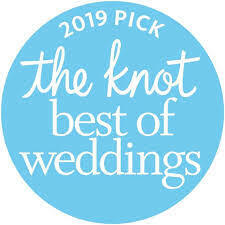 CLICK ICON ABOVE TO READ SOME KIND WORDS FROM FELLOW BRIDES!